Who has this fantastic peace plan? None other than Maharishi Mahesh Yogi, former guru to the Beatles. John Hagelin, Maharishi’s point man and a past presidential candidate, wants to “mobilize the entire country” to “pull together in this hour of need,” according to an urgent message he sent to key leaders within the guru’s Transcendental Meditation (TM) network this week. “Yogic flyers” are something like Maharishi’s spiritual air force. However, these pilots have an unconventional takeoff that consists of essentially going into a trance and then hopping around within various buildings controlled by the guru. Figuratively they are “flying high” through their guru’s meditation techniques, which can produce dissociated states of altered consciousness through something, more commonly called hypnosis. Just like a stage hypnotist can get a subject to cluck like a chicken, Maharishi’s methods make them think they can fly and feel the sensation. And to think world governments rely upon diplomacy and at times military defenses. 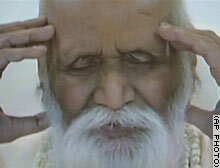 Why bother when Maharishi has this magical solution? But there might be some cost for the faithful to participate in the old guru’s peace plan, at least “$30.00 per day” for “room and board” according to Hagelin. Those palaces have price tags, and Maharishi devotees like film director David Lynch travels around engaged in seemingly perpetual fund raising. Despite Maharishi’s advanced age the guru wants to keep building his global spiritual empire that reportedly is now worth between $6 and $9 billion dollars. At thirty bucks a day the guru’s billions could fund a virtual wave of “yogic flyers” to cover the earth, but something tells me that if Maharishi had to personally pay for his peace plan the guru’s spiritual air force would be grounded. Wow! Thanks, Rick! I tought this old fossil was dead by now. Thank god for his “yogic flyers”. Maybe while they are at it they can disarm North Korea and Iran as well as bring permanent peace throughout all mankind. I will go one step further…if in fact these “yogic liars”(sic) bring about “whirled peas”(sic), I will give my entire earned income to the cause each year as long as I am alive. I don’t think I have anything to worry about. on yogic flying and tm, i have to go by my own experience, which is that i find it energizing, very restful and gives me a lot of inner strength. I have personally attended 2 courses that have produced life supporting influences for the world, one in croatia, when we started the war in the balkans was in a messy stalemate with many lives being lost. within 2 days of the course the violence had dropped and by 2 weeks a lasting peace deal had been agreed upon. $30 for food and lodging my dear freinds…., find me a good hotel that provides organic breakfast, lunch and dinner!